Barbados Blackbelly sheep combine the rare attributes of adaption to widespread environments and high reproductive efficiency, which account for their average of two lambs per litter and an average lambing interval of eight to nine months. Several studies have been made as to the origin of the breed, which has been widely accepted as African. Although there can be little doubt that the Blackbelly has African ancestry, there is compelling historical evidence that the Barbados Blackbelly, as a breed, originated and evolved on the island of Barbados. Following the colonization of Barbados by the English in 1627, several fortuitous factors existed in combinations that may not have occurred in other European colonies in the Americas. The introduction of tropically adapted hair sheep with the slave trade from west Africa. There is, of course, good reason to believe that African sheep were taken independently to other colonies in the Indies and Latin America. In combination with other stock, various local types and breeds were founded, possibly including the wooled Criollo breeds. The concurrent introduction to Barbados of a poorly adapted, but prolific, wooled sheep of unknown origin. The most likely country of origin may have been Holland or England, as each had active colonization and commerce in the region. This unknown parent breed may, more than any other factor, set the Barbados Blackbelly apart genetically from other breeds in the region. An environment including heat, humidity, and parasites, to which wooled sheep were not well adapted. Of particular difficulty were the small burrs in the pastures that clung to and penetrated the fleece. They may have afflicted the wooled sheep so as to have placed constant selective pressure against wooliness. This factor could have kept the evolving gene complex of the Blackbelly from being overwhelmed by that of wooled breeds imported from time to time to "improve'' the mutton characteristics of the Barbados sheep. However, selection against wooliness would not have precluded introgression of other genes, such as those for prolificacy or polledness, into the Blackbelly. During the first 25 years of colonization, Barbados established commerce throughout the West Indies with the New England colonies and with European countries, including Russia. Wooled sheep may have been imported from these trading partners and other colonizing countries of Europe. Whatever the origin of their wooled ancestors the sheep of Barbados moved from their precarious beginnings to a place of importance in Barbados agriculture. By 1680, ''visitors were delighted by Barbados sheep, fat, sweet mutton, fed on sugar cane." The evidence reviewed supports the view that the Barbados Blackbelly evolved from crosses of African hair sheep and European wooled breeds. In the case of the Barbados Blackbelly, Ligon established in 1657 that the parent stocks necessary for the evolution of a highly prolific, tropically adapted breed had been established in Barbados in the first quarter-century of colonization. The prolific, wooled ancestor of the Barbados Blackbelly has not been identified. Evidence is presented that the Dutch had the specially fitted ocean craft, the trading opportunities, and possibly, the most likely breeds to have introduced the prolific, wooled ancestors of the Barbados Blackbelly. Speculation that the Barbados Blackbelly might have been introduced ''ready-made'' from elsewhere is not consistent with available historical or genetic evidence. Barbados Blackbelly Introduction to U.S.
Four ewes and one ram of this breed were originally introduced into the U.S. by the USDA in 1904. No official record has been found of further introductions, but anecdotal reports indicate that additional Barbados Blackbelly sheep were imported into the U.S. subsequent to this original importation. The most noteable of these is the importation from Barbados in 1970 by North Carolina State University Professor Lemuel Goode to establish a purebred research flock at the university. Currently, between 250,000 and 500,000 descendents of these sheep are found in Texas, where virtually all flocks have been crossed to varying degree with domestic sheep, mostly Rambouillet, and in recent years with the European Mouflon, a wild species. Game management officials refer to the resulting crossbreed as Moufflon-Barbados or Barbado. 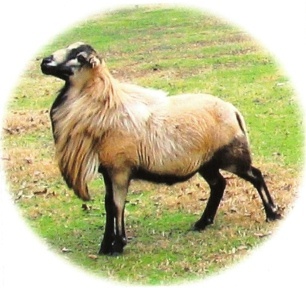 Through careful selective breeding for horn growth, shedding ability, and color characteristics, this crossbreed was developed into a seperate breed of sheep called the American Blackbelly. As of 2007, there are fewar than 400 Barbados Blackbelly sheep in the continental U.S. The majority of these sheep are held in research flocks owned by Virginia State University and the former North Carolina State University flock (sold in 1996 to a private breeder). In addition, a handful of private breeders recognizing the genetic crisis that was extinguishing the breed in the U.S., formed an informal cooperative to preserve the remaining genetics and reestablish the breed in the U.S. Coat: Complete covering of medium to thick-hair (no wool) that sheds in the spring. Barbados Blackbellys in the colder U.S. climates often develop protective wool undercoats during the fall and winter that also sheds in the spring. Color: All shades of brown, tan or yellow, all are highlighted with contrasting black underparts with contrasting black underparts extending down the inside of the legs. Black points on the nose, forehead, and inside of the ears are black. Rams have a neckpiece of thick hair which extends down the neck to the brisket, some may cover to the shoulder. Head: Medium in size and well in conformation to the neck and body. There is a slight tendency to a roman nose, especially in the ram. Ears point forward from the side, they should not droop. Horns: Both sexes of the Barbados Blackbelly are polled. Neck: Medium in length, slender in conformation to body size. Rams are heavier and well set to the shoulder. Body: Fairly deep with well-sprung ribs. There is a fair width of back and loin, but a very deficient hindquarter (similar to a goat's). The rump is quite steep from the hips to the pin bones and the tail is set very low. Legs: "Leggy", and generally are quite well set. In general appearance (at a distance) these sheep resemble small deer or antelope. They are very active and lively. They are alert at all times. 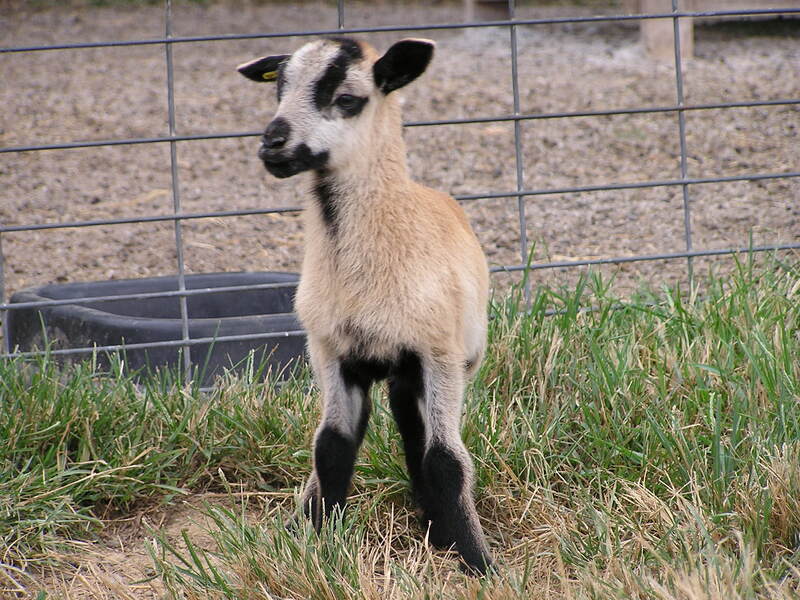 Compared to the more recognized "mutton type", Barbados Blackbelly sheep are less "squatty" and are slower growing. Observation indicates that while Barbados Blackbelly withstand either heat or cold well part of this adjustment to extremes is behavioral rather than physiological. For instance, cold wind or warm sun rather quickly results in a herd finding refuge in some shelter under conditions when wooled sheep remain in the open. They are extremely reactive to strange dogs or cats, usually acting as though wishing to flee. In a close corral and in the defense of their young, less timid individuals show protective behavior, raising a front leg as though warning off the predator and occasionally bristling the hair on top of the neck and even jumping at the animal to strike with the fore feet. Ewes with very young lambs show protective behavior to a high degree. Some individual rams will charge dogs repeatedly with little or no provocation. Mature Barbados Blackbelly ewes have a high prolificacy. Studies have shown the average lambing rate to range between 1.50 to 2.30 lambs per ewe lambing. Body weights of yearling ewes are variable due partly to the tendency to breed and lamb as ewe lambs (<12 months old), and depending whether pregnant at the time of weighing. Most weigh 80 to 90 pounds, with mature ewes 100 pounds, and rams 105 to 125 pounds. Carcass studies of 5 to 7 month old male lambs sent to slaughter show that Barbados Blackbelly lambs have much less body fat than do other comparable sheep breeds. Fat over the ribeye muscle (longissimus dorsi) at the twelfth rib averages 1.5 to 2 mm compared to 5 to 6 mm on similarly reared Suffolk or Dorset crosses. Kidney and kidney fat as a percentage of carcass weight is 0.75 to 1% as compared to 2.5 to 3% or more for Suffolk and Dorset crosses. Marbling in the rib-eye muscle and feathering between the ribs (intramuscular fat) is less evident than in regular (wooled) market lambs. Since USDA grade is strongly influenced by feathering, Barbados Blackbelly tend to grade medium to high good, rather than choice. Muscling is less well developed than in "improved'' meat breeds of sheep, but rib-eye areas per 50 pounds carcass weight of the longissimus dorsi at the twelfth rib are above those of the average market lamb. These measure 2.0 to 2.4 square inches in surface area. Part of this advantage is due to small carcass weight, commonly 30 to 40 pounds, and to lower percentage of fat in the carcass. Flavor of the meat is excellent, being much milder than in our usual market lambs. This is probably due to less fatness, since the characteristic flavor of lamb meat is primarily in the fat. Ram lamb gains as measured by weight per day of age 5 to 7 months are .40 to .45 pounds per day when fed on rations of alfalfa hay and wheat with a mineral supplement. These gains are perhaps 60 to 70% of the normal expected gain for wooled sheep on similar rations. Barbados Blackbelly sheep are connsidered to be resistant to the effects of internal parasites. In many parts of the U.S., no deworming is necessary when adequate pasture rotation and good husbandry are employed.These sheep are also resistant to most of the sheep diseases that can easily dessimate unvaccinated wooled flocks. Thus, it is much easier to raise Barbados Blackbelly sheep without chemical intervention, making them popular with breeders serving organic and ethnic markets. These hair sheep are fully fertile in crosses with other breeds. First crosses with wool breeds include those that shed only part of the wool on the body such as belly, lower neck, and sides. Later backcrosses to the Barbados Blackbelly result in animals that will shed completely or almost so. Crosses with the Dorset Horn and Suffolk have resulted in a pronounced increase in growth rate of progeny. Those with the Suffolk have resulted in the extremely seasonal estrus cycle characteristic of that breed. A limited number of crosses with the Dorset have cycled throughout the year. The Dorset cross appears to decrease nervousness and increase docility in both lambs and ewes. Combs, W. 1983. A History of the Barbados Blackbelly Sheep. Chap. 2.13, Hair Sheep of Western Africa and the Americas: A Genetic Resource for the Tropics. (H.A. Fitzhugh and G.E. Bradford, eds. ), A Winrock International Study, Westview Press Inc., 5500 Central Ave., Boulder, Colorado, 80301. 317 pp.